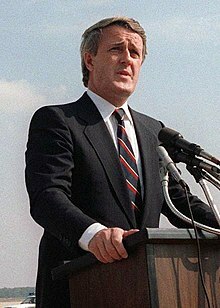 Martin Brian Mulroney (born March 20, 1939) is a Canadian politician who served as the 18th prime minister of Canada from September 17, 1984, to June 25, 1993. His tenure as prime minister was marked by the introduction of major economic reforms, such as the Canada-U.S. Free Trade Agreement and the Goods and Services Tax, and the rejection of constitutional reforms such as the Meech Lake Accord and the Charlottetown Accord. Prior to his political career, he was a prominent lawyer and businessman in Montreal. You accumulate political capital to spend it on noble causes for Canada. If you're afraid to spend your capital, you shouldn't be there. The Conservatives over the years have done a great deal, from Sir John A, to Diefenbaker, and others. For example, the Prime Minister earlier this year talked about the importance of the Arctic to our future. He's right. A hundred years from now, the strength of Canada is going to be coming from our resources in the Arctic. We created the Cabinet Committee on the Environment to review the environmental implications of all government initiatives. I think what made us successful was the fact that it was a sustained approach. We did something new every year. Trudeau's contribution was not to build Canada but to destroy it, and I had to come in and save it. We decided that the environment was an integral part of our policies and the political thrust of our government. We gave it the priority and we sustained it with the money required to make it happen. You can't be chasing 15 rabbits. Otherwise, the public mind cannot follow you. Once you articulate an agenda, you have to follow it. I can see now a vision emerging how Canada is going to profit in the future from our Arctic resources without destroying the environment on which it is all based. When I appointed the Minister of the Environment to major cabinet status, the Planning and Priorities committee, the signals that that sent through Ottawa were major, because that's what the bureaucracy understands. I think the government has to reposition environment on top of their national and international priorities. So that was Reagan's political problem. As a rancher in California, he was an environmentalist himself. But the President of the United States doesn't control everything that happens in Washington. Whether the process proves to be Kyoto or something else, let's acknowledge the urgency of global warming. And look, I was a big, brassy guy who won and won big. I did what I wanted. It's my responsibility, and entirely my fault, Of course I regret it. It's the kind of locker-room conversation we all use, but as prime minister I shouldn't have used it. And, of course, the fact that Maurice Strong, a Canadian, was in charge made it important for us to pull up our socks and become leaders in this field. Now, here is a field we should be a leader in! There are so many demands on your time, on your resources, and on the prestige of the government. If your only objective is to be popular, you're going to be popular but you will be known as the Prime Minister who achieved nothing. You have to spend your political capital on great causes for your country. I would go to them and I would explain this is the price of going forward. We're going to move ahead in all these other areas. We're moving ahead in tax reform and GST, we are moving ahead on trade, but this will not be done at the cost of the environment. In politics, madame, you need two things: friends, but above all an enemy. If everything is very important, then nothing is important. Every cabinet minister gets a mission statement from the Prime Minister. You cannot name a Canadian prime minister who has done as many significant things as I did, because there are none.